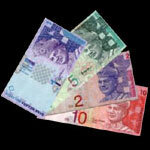 Malaysian Currency - brief information about travel in Malaysia. Foreign currency and traveler's cheques can be converted into Ringgit at banks or authorized money changers throughout the country. Resident travelers are allowed to carry into and out of the country any amount not exceeding RM1,000 per person and also export foreign currency not exceeding the equivalent of RM10,000 per person. Those who are carrying in excess of these - when entering or leaving the country - are required to obtain permission from the Controller of Foreign Exchange and declare in the Traveler's Declaration Form the exact amount of Ringgit carried. Approval is usually given within one day of application. Non-residents are allowed to bring in any amount of foreign currency (including traveler's cheques). However, declaration in the Disembarkation Card issued by the Immigration Department is required when an amount in excess of US$2,500 is brought into the country. Non-residents must also obtain permission and declare Ringgit exceeding RM1,000 when leaving or entering the country.